Instagram, which is owned by Facebook, is one of the more recent social media outlets and it is heavily used for marketing purposes. As a service that revolves around photo and video posts, it allows for a different kind of marketing than platforms that are predominantly text based. Generating views and clicks on such a platform continues to become a more difficult task as there is seemingly an endless sea of advertisements in almost every industry. Hope is not lost, however, as there are techniques that can be applied to ensure that your marketing attempts do not get lost in the proverbial sea. 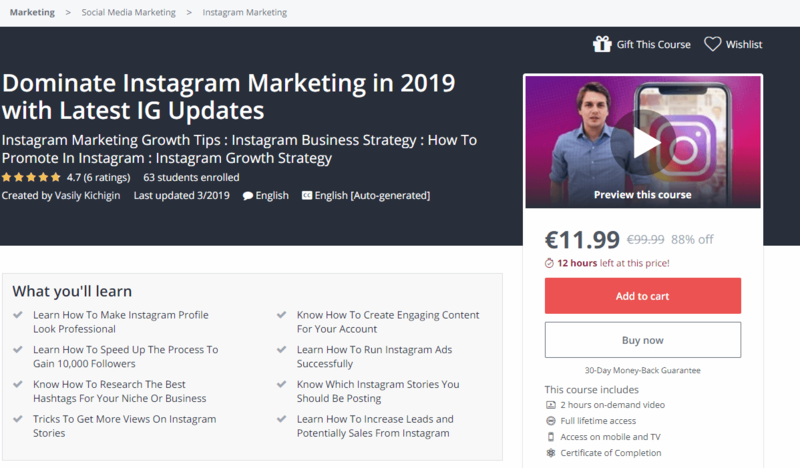 Gaining the required perspective to apply the right techniques is possible with the insight provided by Instagram courses that are geared towards improving your marketing abilities and your influence online. 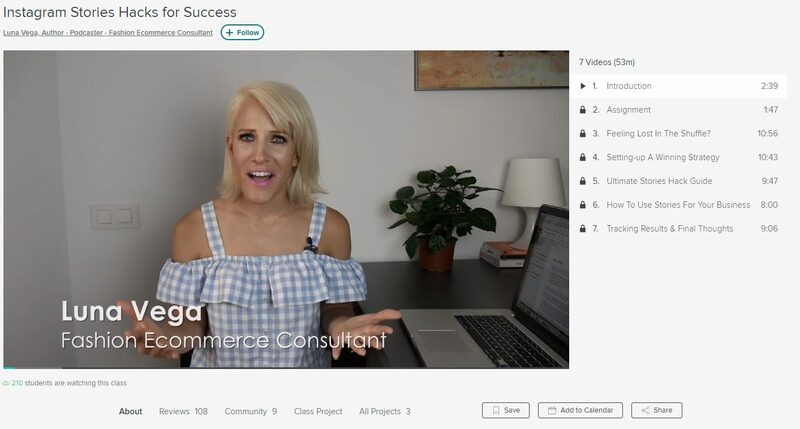 Udemy and Skillshare are two platforms, which can be used to gain these insights and below is a list of the eight best courses that can be used to do so. Please note that while Udemy courses have an individual cost, Skillshare is a subscription-based platform with two subscription tiers. Once subscribed you can begin to view courses that interest you and so there are no prices listed for Skillshare courses below. 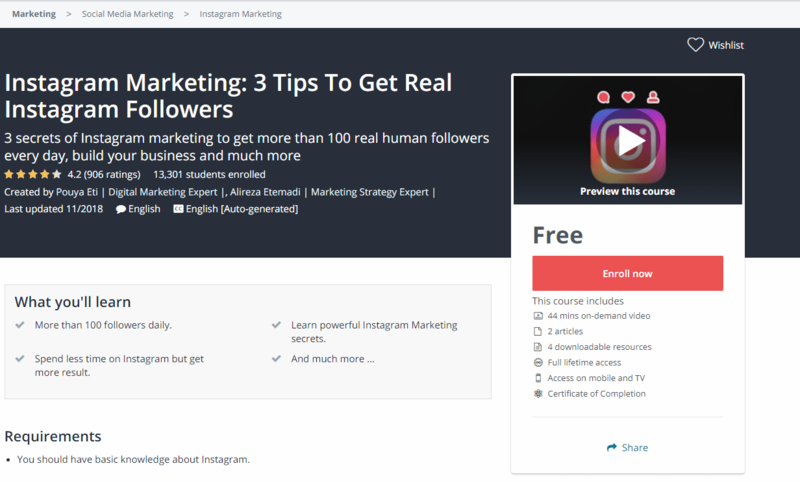 Also, don’t forget to see options on how to automate your business with Instagram bots. There is no doubt that the name of this course offered by Udemy sounds like the impossible. However, the 44,000+ students and the 4.5-star rating on this course contradict that premise. Once this course is paid for, you are given full lifetime access to 23 hours of on demand video, 11 articles, 125 downloadable resources, and the ability to access all this on TV, via mobile, or via PC. A Certificate of Completion is awarded upon completion of the course. At the time of writing, this course is available at a special price of $11.99 (the cost is usually $199.99) and purchase can be made on the course page. The purchase is protected by a 30-day money back guarantee. 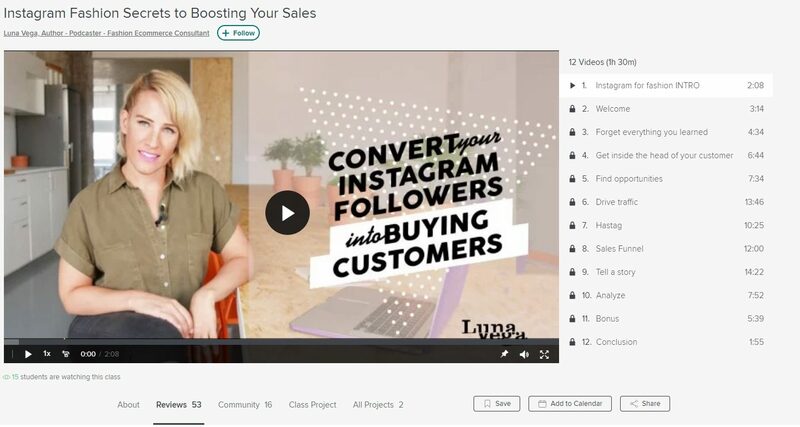 These objectives are all covered in individual videos and the course culminates in a real-life project that requires you to setup an Instagram ad and share the engagement results along with your allocated budget. Once you have shared this, you are eligible for advice and guidance from the course instructor. Reviewers of the course have alluded to its meeting or exceeding of their expectations. 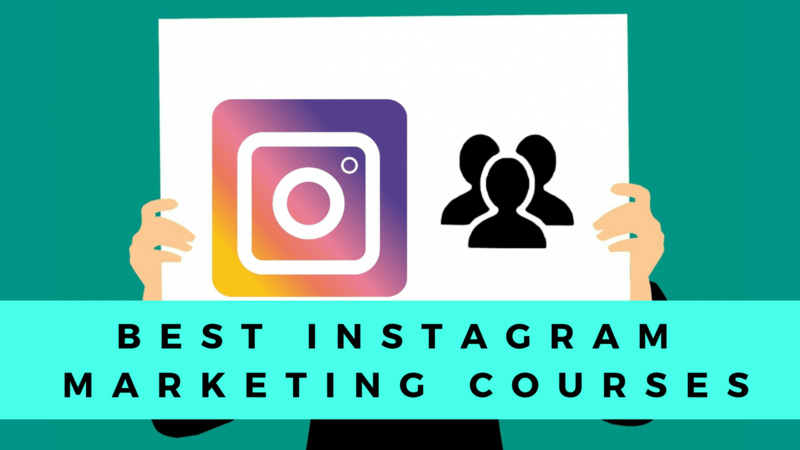 The course is most suited to beginners that want to dive into the world of Instagram ads in a short time. You may review the course at its official page. The course is available on the course page for $11.99 at the time of writing, a 94% reduction to the regular price of $199.99. There is a 30-day money back guarantee available if you are unsatisfied. The course duration is 1.5 hours, which spans 12 videos and it includes two projects. Most students who reviewed the course have indicated that it either meets or exceeds their expectations. You can review the course on its official page at Skillshare. 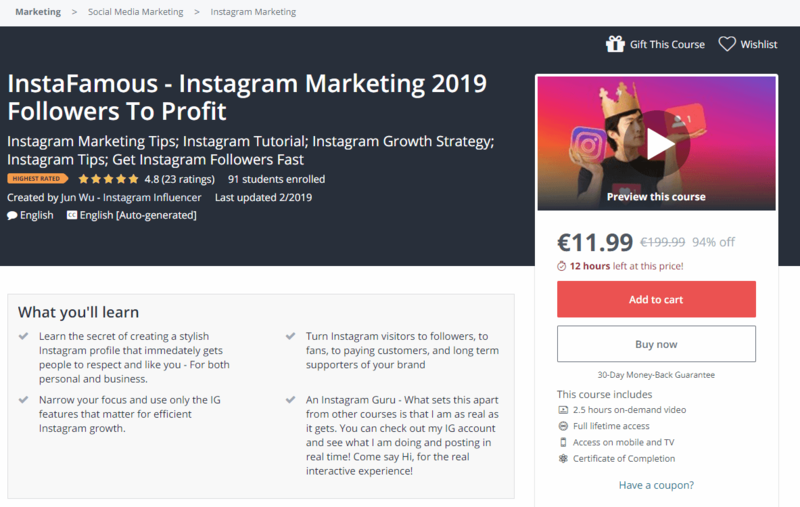 The course, which is branded as a comprehensive tour of Instagram as opposed to lectures, culminates with a Certificate of Completion, and it can be purchased at a reduced price (at the time of writing) of $11.99 on the course page. This purchase comes with a full 30-day money back guarantee. 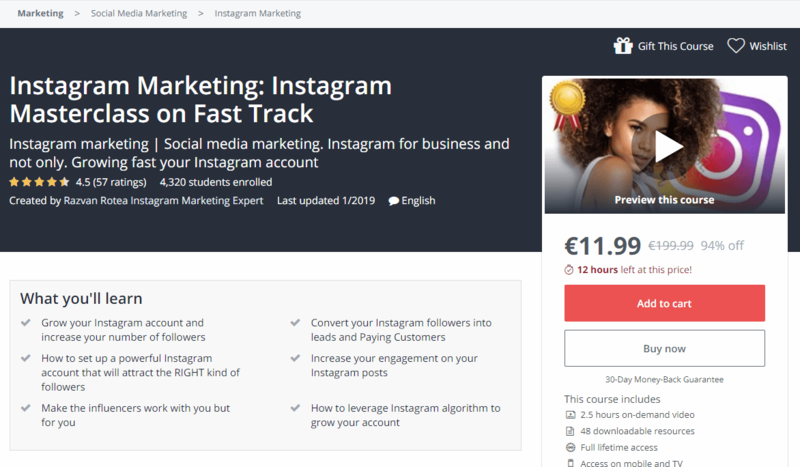 The requirements for this course are simply having an Instagram account and making commitment to act based on the insights the course provides. The course duration is two hours, and enrollment guarantees full lifetime access to the course videos. Completion of the course is rewarded with a Certificate of Completion. At the time of writing, you may purchase this course on its webpage for $11.99, which is an 88% reduction in the full price of $99.99. Of course, there is a 30-day money back guarantee should you not be satisfied with the content. The stories functionality of Instagram is one of the newer features that allows you to upload content to be displayed for 24 hours after which it is automatically removed. Unlike regular posts that require potential viewers to discover them by scrolling along their newsfeed, stories appear in a bubble type notification to stand out. This Skillshare course encourages you to leverage the power of stories whether it be through a simple story post or a story ad. The idea here is to help you double your engagement as Instagram statistics show that 75% of users act upon what is viewed in stories. For a good visual map, there is also a review of brands that have successfully integrated stories to increase their growth. Avoiding becoming lost in the vast content shuffle. If you are interested in this course, you can review it on its course page. 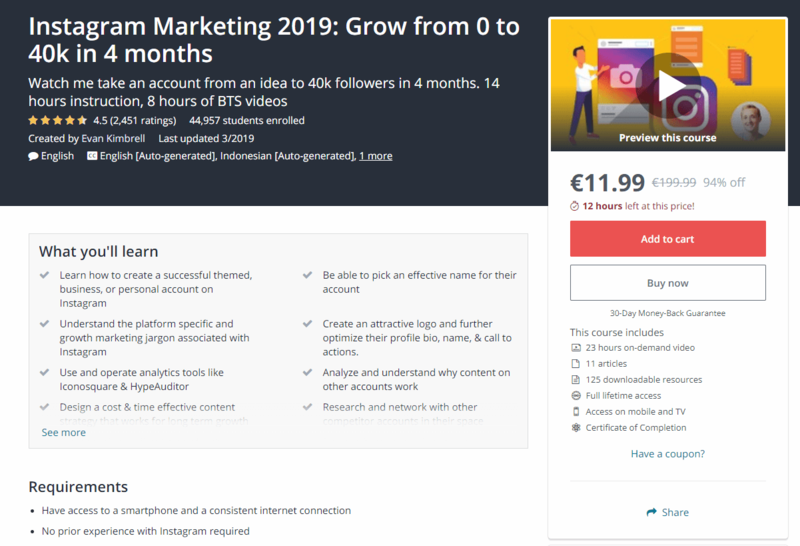 The only requirement is a simple one, which is having basic knowledge of the Instagram platform. Should you be interested in the course, you can review a comprehensive description of it and enroll at the official course page. The courses listed here are baseline for your studies and are no means the complete extent of learning resources for everything Instagram related. However, there is no denying that enrolling in one or more of these courses in an important investment in yourself and/or your business that provides you with the necessary information to get yourself placed in the eyes of your target audience while giving the desired impression.